Programs can be eligible to receive a grant from Emploi-Québec or as a training session under the 1% Law (The Skills Act) to promote workforce skills development and recognition. You may select one of our “Nature Adventure” programs to show appreciation to your employees for their commitment and to demonstrate your appreciation or simply to provide a unique opportunity to improve your company’s morale and social environment. Prices vary according to the number of participants, activities and services selected. You may contact Carole Turcotte at 450 834-4441to help select your program. This program is intended for team leaders, project managers or professionals who work as a team. You can create your own group or join one of our scheduled groups and events. Along with an instructor and guide-interpreters, you will experience a day outdoors to help you understand the importance of each team member. 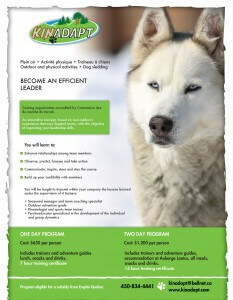 You will learn how to lead a dogsledding team. You will be guided and coached through the art of communicating with your dogsledding team and leading them in the direction you want to go and finally, you will learn what role you have to play to motivate them. You may contact Carole Turcotte at 450 834-4441 to help select your program. 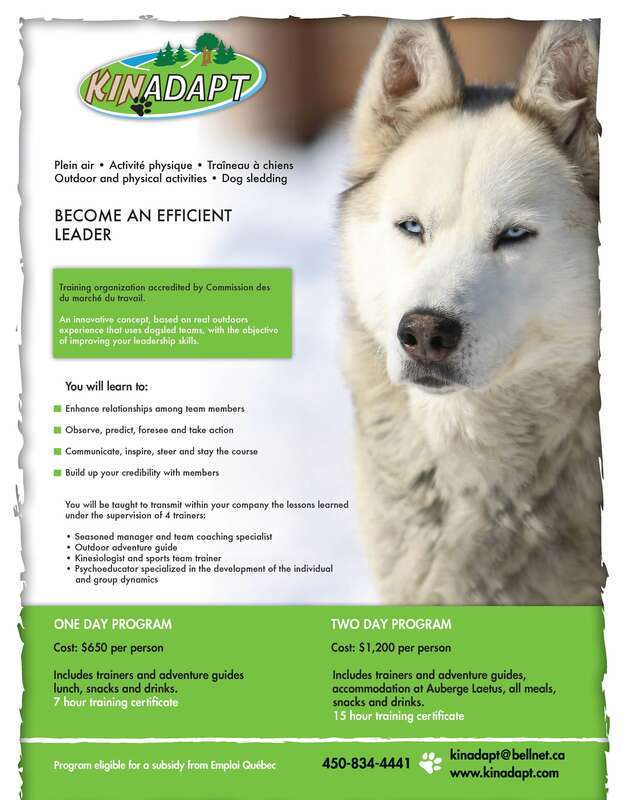 You will learn how to lead a pack of huskies and get a glimpse into the world of dogsledding. The instructor will ask that you observe, practise and grasp the various management principles that are applicable to living resources and transferrable to human resources. You will join a group of managers from various environments. This experience is intended to help you acquire more efficiency and to help you better manage your employees and your department heads. You will understand your own management abilities and learn to transfer these skills and abilities to become a better, more efficient pack leader.